Ahlen, December 2017. – With the opening of its new Iconic World, Kaldewei has created an extraordinary brand experience. After a year and a half of planning and construction, a fascinating interactive and multisensory space has been produced allowing visitors to explore the Kaldewei brand. The newly designed exhibition allows insights into the premium manufacturer’s understanding of design and gives visitors the opportunity to see the quality and durability of Kaldewei steel enamel for themselves. Additionally, the visitor experience is enhanced by a complementary tour of the factory during which visitors get a close-up look at the manufacturing process. The diverse themes on show at the Kaldewei Iconic World address the needs of all visitors who travel here from every corner of the earth, from architects, investors and project decision-makers to plumbers and wholesalers. Over four levels, visitors are immersed in the captivating Kaldewei brand world. Alongside the premium manufacturer’s latest developments and groundbreaking design studies, they also have a chance to see the wide range of colours and outstanding material properties of Kaldewei steel enamel. In the basement, visitors are given a sensory and tangible taste of the Kaldewei brand’s four dimensions: integrated bathroom solutions, Iconic Design, global partnership and steel enamel. 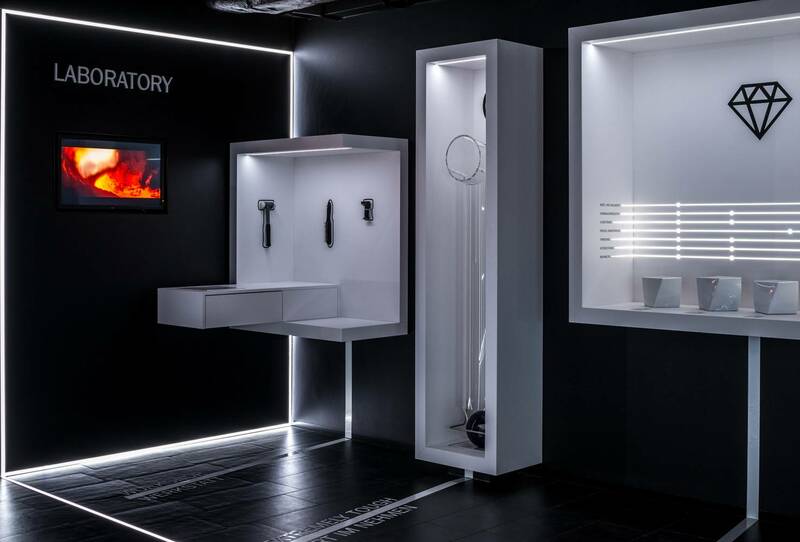 Visitors firstly walk through a multisensory tunnel which features an audiovisual presentation of the three Kaldewei product worlds: washbasin, shower surface and bathtub. This powerfully evokes the subjective sense of wellbeing in the bathroom. At the end of the tunnel, visitors arrive at the heart of the exhibition – the Iconic Center – where they come face to face with an epoch-making and pioneering piece from the company’s history: Kaldewei’s first freestanding bathtub made in 1934. The Iconic Design area impressively conveys to visitors the Kaldewei brand’s understanding of design, and the standard it sets itself in this area. To exemplify this Franz Kaldewei has brought together his personal design and architecture icons to demonstrate the value of timeless design. In addition the Designers’ Gallery invites visitors to interactively explore Kaldewei’s design partnerships with Sottsass Associati, Phoenix Design, Arik Levy, Studio Aisslinger and Anke Salomon. Kaldewei operates worldwide and its bathroom solutions are evident in leading hotels and homes across all five continents. An interactive multimedia pillar attractively presents a selection of –hotel and residential case studies, accompanied by more in-depth information about them. One of the key sections of the new Iconic World is the Material Excellence area. Here it quickly becomes apparent why Kaldewei steel enamel became the company’s brand core. Visitors discover the material’s distinctive qualities by means of impressive experiments. These include dropping a 7-kg weight onto an enamelled shower surface or heating a steel enamel plate to a temperature of over 1000 °C with a Bunsen burner flame. Guests have the opportunity to experience the advantages of steel enamel illustrating first hand why this material is the ideal choice for bathrooms. The new Kaldewei Iconic World was designed by the architectural firm Schmidhuber. More information at www.kaldewei.co.uk/iconicworld. With the opening of its new Iconic World, Kaldewei has produced an extraordinary brand experience. After a year and a half of planning and construction, a fascinating space has been created for the interactive and multisensory exploration of the Kaldewei brand. Visitors firstly walk through a multisensory tunnel which features an audiovisual presentation of the three Kaldewei product worlds: washbasin, shower surface and bathtub. The Iconic Design area impressively conveys to visitors the Kaldewei brand’s understanding of design, and the standard it sets itself in this area. To exemplify this Franz Kaldewei has brought together his personal design and architecture icons. Kaldewei operates worldwide and its bathroom solutions are evident in leading hotels and homes across all five continents. An interactive multimedia pillar attractively presents a selection of hotel and residential case studies, accompanied by more in-depth information about them. One of the key sections of the new Iconic World is the Material Excellence area where visitors discover the material’s distinctive qualities by means of impressive experiments.